The Uptown-Broadway Building at Leland and Broadway, a strong contributor to the Uptown Square National Historic District. The CTA tracks (right) run directly behind it. Forty-four buildings over 380 acres surrounding the Broadway and Lawrence intersection were added to the National Register of Historic Places as a district in 2000. Virtually all of the contributing sites represent the classical revival and commercialist architectural style, most prominently seen in the Uptown Theatre, the Uptown Bank Building, and the Uptown-Broadway Building. Prophets for Uptown’s perpetual ‘renaissance’ have since at least 1960 highlighted the aesthetics represented in the historic district, envisioning a return to the prewar Jazz Age.I believe the ill-fated CTA viaduct across Broadway is part of the historic district—-something that amazingly did not come up in the Section 106 meeting. The plans will clearly annihilate all shreds of historical integrity for the track structure. The historic district is a vital piece in the latest push to grow Uptown’s middle-class viability. A major part of this vision has yet to take shape. Like plans for the neighborhood, in general, the renovation of the Uptown Theatre (estimated to be at least a $70 million project) are still in the rumor stage. But another key element to Uptown’s latest renaissance is a go—-the $203 million reconstruction of the Wilson CTA Station. A mix of federal and local funds have been set aside (though technically not ‘committed,’ due to the Section 106 and National Environmental Protection Act (NEPA) processes), and the CTA has worked with stakeholders in initial designs, which they made public last year. 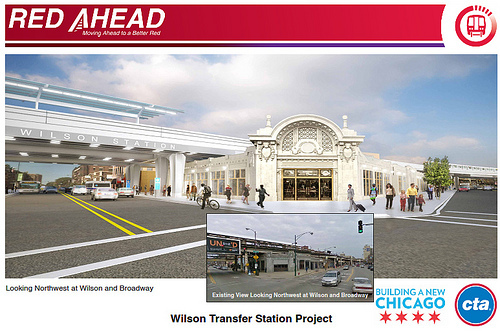 The latest CTA rendering, looking south from Broadway and Leland. Leland and Broadway, looking west across Broadway. The current support structure creates a slalom-like adventure for drivers along Broadway. 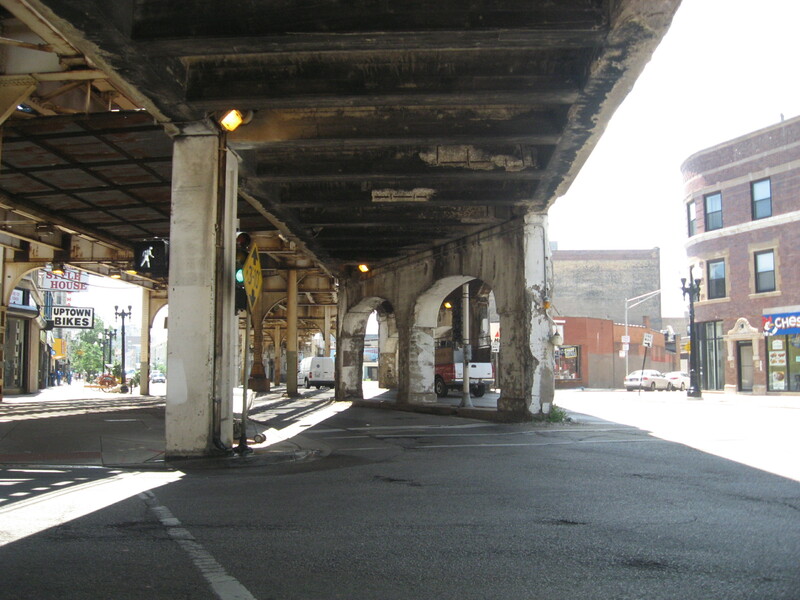 The CTA is determined to remove all the columns and viaducts in the middle of Broadway. Subsequent engineering needs will result in a steel beam a few feet in front of the Barry Building (right). The public greeted the initial CTA plans with a mixed response. The careful restoration of the Gerber Building exterior, which has served as the main station house since 1923, was enthusiastically received. But worry surfaced about designs for the interior of the building, particularly a grand staircase. Others were unsatisfied with plans for the Majestic Building under the tracks on the other side of Broadway. It seemed it was simply in the way of the renovation. And, last but not least, the stark and angular new support beams left many cold. CTA rendering of the renovated Gerber Building. The abandoned Majestic Building, on the northeast corner of Leland and Broadway, will be converted into a solid support pier. But un-glazed transparent panes will create depth, allowing it to retain some integrity as a storefront. So it was back to the drawing board. 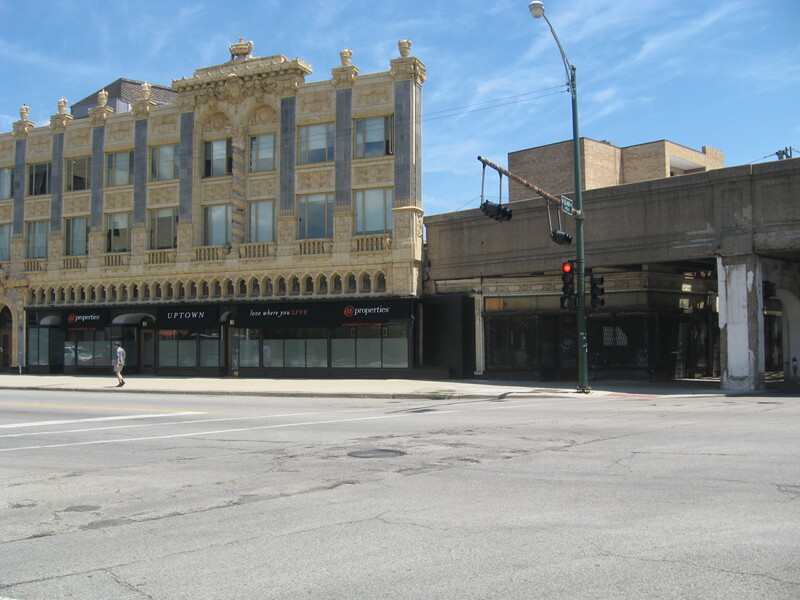 CTA planners addressed most of the concerns about the Gerber and Majestic Buildings. But somewhere along the way those support beams became even more stark, and also moved significantly closer to the Leland and Broadway storefronts. The CTA is impressed with the “open” look its design will create across Broadway. I prefer this gracefully framed view of the current design. The July 26 Section 106 meeting was held in the Weiss Hospital auditorium. The CTA provided several clear signs that referred directly to NHPA and 106 and pointed towards the meeting site. About 70 people filled the auditorium to about half capacity. Befitting the scope of this project, the CTA came well prepared and showed that this was not their first 106 rodeo. I counted at least 15 CTA badge-wearers either on stage or milling about the lobby. The CTA had a videographer, a court reporter, and ASL and Spanish interpreters at the ready. The CTA chief engineer was in attendance (and eventually spoke, if reluctantly). Most of the consulting agencies were represented, too. At least three FTA employees were there–including the regional specialist for 106 proceedings. The Illinois State Historic Preservation Office (SHPO) in Springfield listened in via phone. I recognized representatives from other consulting parties such as the City of Chicago Landmark Office. After a welcome by Alderman Cappleman (who did not give any indication about the centrality of 106 for this meeting), CTA representative sped through a few dense PowerPoint slides describing Section 106. A few more slides detailed the development of the Wilson plans, a revision of the Area of Potential Effect (APE), the marshaling of consulting parties, and the progress towards a Memorandum of Agreement (MOA). 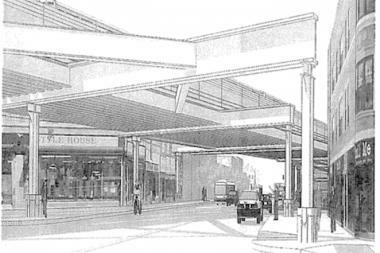 The CTA showed its most recent renderings of the platform and the support columns. Without question, it is the placement and design of the columns that dominate community concerns about the project. The CTA foregrounded the opening of comments by stating that—-in general—-the essential elements of the design are complete (even though bids have not gone out (and can not go out) until the Section 106 process unfolds. They were most interested in feedback about the finishing details of the columns, like paint color and ornamentation around the base. The CTA seemed very pleased with itself for coming up with a base design that reflected the Gerber Building terra cotta. What’s not to like? Who would object? Well, this was an Uptown community meeting after all. Although not as dramatic as, say, when the Black Panthers met up with angry poor southern whites in 1968 or when said angry southerners crashed an urban renewal meeting, the meeting did reveal fissures between the idealized historical character of the neighborhood and development. There was no attempt to forge a revolutionary cadre at the Section 106 Meeting, unlike in this 1968 Uptown gathering. 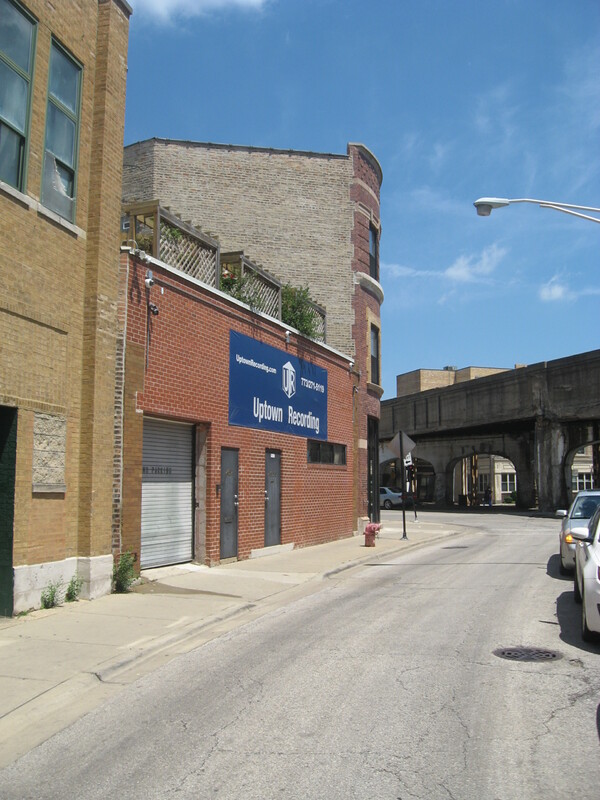 The first public comment came from a representative of the Chicago Buddhist Church, located at Leland just west of Broadway since 1956 (the latest iteration of the church building is too new to be included in the historic district). The speaker directly critiqued both the look and the location of the proposed columns. He explained that the congregation values the vista eastward across the intersection of Leland and Broadway. 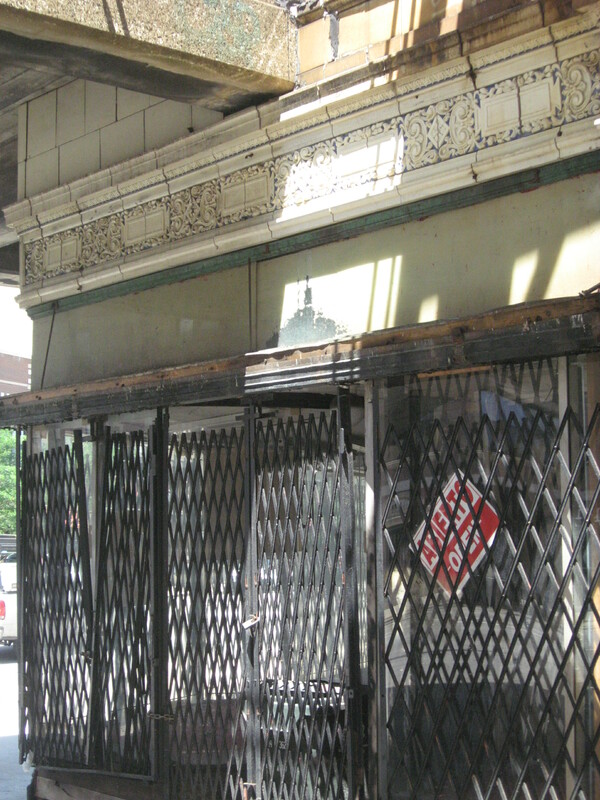 He eventually questioned the absolute necessity of removing all columns from Broadway, which is the CTA’s justification for placing the new steel column so close to the Leland storefronts. Later in the meeting the speaker revealed that he is a retired engineer. He sketched an alternate proposal for the column and submitted the scratch paper as an official comment to the CTA representatives. The Uptown Recording Studio–a ‘non-contributing’ building in the Historic District–dominated the Section 106 discussion. The most extensive comments came from the attorneys representing the Uptown Recording Studio on Racine just a few yards from the Leland and Broadway intersection. 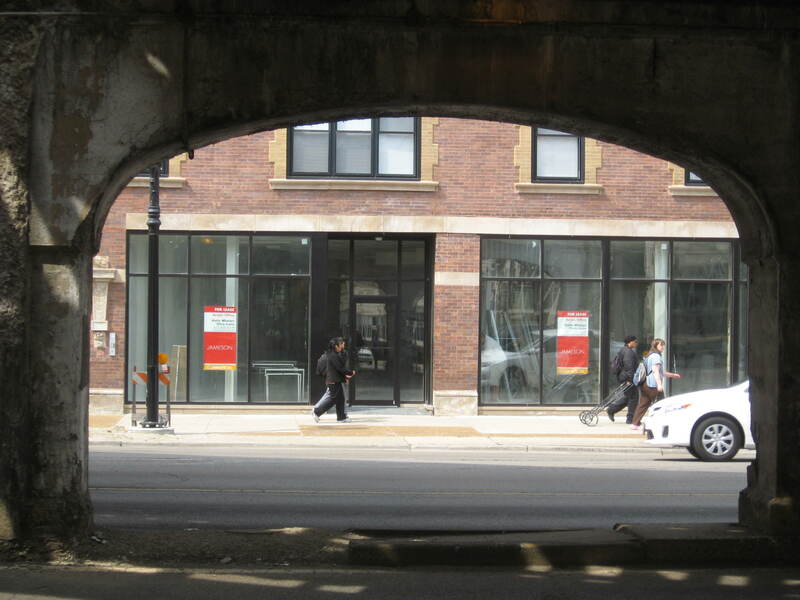 As a non-contributing building in the historic district, the Uptown Recording Studio had not been a consulting party for the ongoing CTA plans. The lawyers objected to the late notice of the meeting and decried the CTA’s slow response to Freedom of Information Act requests about alternative plans. While valid, the attorneys’ comments had little to do with historic integrity. Understandably, as a recording studio, the business owners worried about the vibrations from the re-positioned column. Eventually, the CTA representatives more forcefully reminded the audience that comments should stick to the 106 topic. The public comment process for the environmental impact of the project is scheduled for a later date, and promises to be substantive. The CTA consistently hid behind their concern for traffic safety when pressed about the removal of columns from Broadway. Representatives continually cited the fact that 20% of all traffic fatalities involved a fixed object. Yet they never cited specific statistics for the reportedly exceedingly dangerous intersection in question. I suspected that if the wreck numbers were high for Leland and Broadway, we would have heard about it early and often. So, I requested the statistics myself. And, thanks to the remarkable efficiency of the Illinois Department of Transportation, I learned that only 30 traffic accidents have been recorded within 30 feet of the intersection…from 2007-2011. Furthermore (if I’m reading the report correctly), only one of those accidents were of the single-car variety. It seems that the persistent ramming into the columns was more myth than reality. 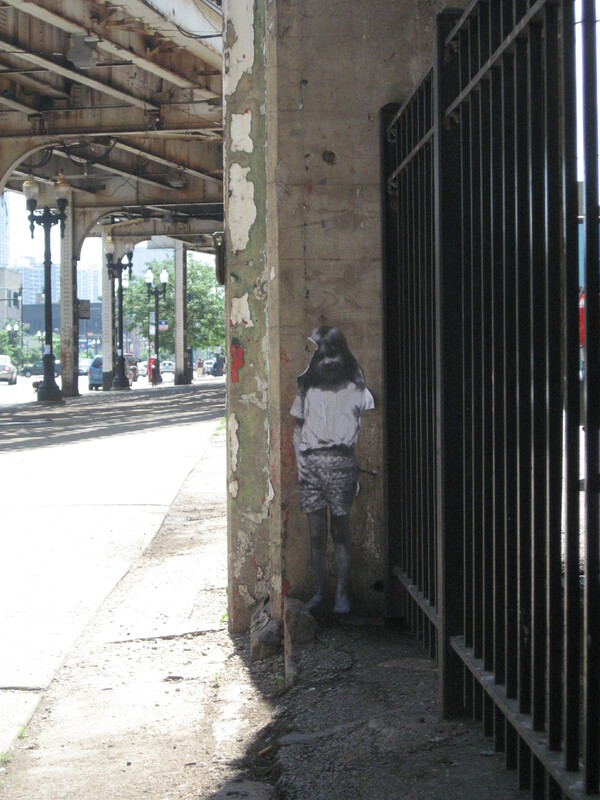 A street artist pasted several of these ghost-like images on the old concrete supports. The CTA allowed the attorneys for the Uptown Recording Studio to speak again, after it appeared everyone else who wished to speak had done so. The lawyers formally requested to be added to the MOA, and concluded by asking the Section 106 process be taken into mediation by the Advisory Council on Historic Preservation (ACPH), an independent Federal agency tasked with overseeing preservation controversies. So far to my knowledge, the ACPH has not entered into the process as a consulting party. My understanding is that either the public or parties to the MOA can request that they take a role. Then it is up to the ACPH to decide whether to involve itself. I don’t believe this particular controversy will result in ACPH mediation. Like Tangora, I suspect that the ‘fix is in,’ and that the CTA is determined to straighten the tracks and remove the columns and viaduct from Broadway. These structural changes will result in the the much more prominent beams jutting from the track level and new columns placed well into the sidewalk at the corners of Leland and Broadway. The CTA seemed open to aesthetic treatments to these new columns that will be more in-line with the historic character of the area. In a discussion with another preservation veteran very familiar with the project, I learned that it was hard enough to retain the Majestic Building at all during the consultation process. And that considerable effort went into convincing the CTA to keep the feeling of a main station inside the Gerber Building. The Section 106 meeting finally broke up after over two hours. 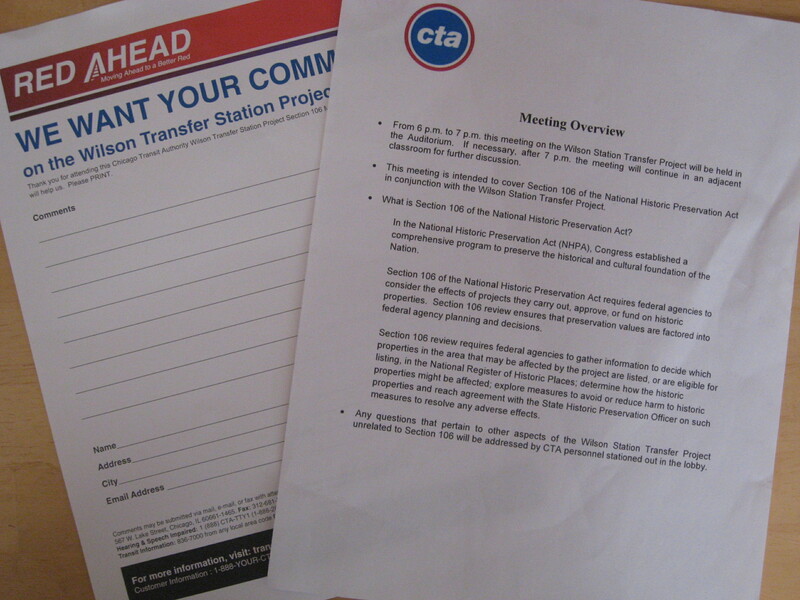 The CTA humored the potential for a second meeting, and reminded the audience that comments were still welcome via mail or email. The NEPA process meeting, scheduled for a few weeks from now, promises to rehash many of the concerns. I’ll miss the concrete viaduct arches that diagonally bisect Broadway. Driving or walking through them offers a visceral announcement that you are passing through a unique urban space with deep historical context. That integrity of feeling will be lost (what certain preservation experts refer to as the unspoken “Criteria E,” for emotion), but nothing in Section 106 requires the responsible agency to retain every historical aspect within the APE.